We all eventually get there but some of us are good at ageing well. What is the secret to being fit past fifty and ageing well? This guide presents some of those secrets. These guidelines are a part of my Health Guides series. Hi, welcome to the Guide to Ageing Well: Being Fit Past Fifty. When I hit 50, the ageing process started to feel real for me. The challenges that I had, and many of my friends and family had when they were younger, started to change and perspective started to change. This guide is all about how to age well and how to continue those years with good quality of life. When I speak to my older clients and friends, the quantity of years doesn’t seem to matter as much as what those years going to be like. The want to know how to keep and maintain their independence and how to keep the joie de vivre in the ability to do all the things that they finally have time to do. This guide really starts putting together important things, such as, what are the motivators to keep us going despite being retired? What are some of the key tips that keep us going? There’s a great interview with Dr. Sarman, who has been a doctor of physical therapy for over 40 years. She presents her views, in her 70s, on aging. There are also product suggestions, such as standing work stations and full spectrum lights. Within this guide there is a mishmash of things that hopefully you’ll find helpful in your quest to aging well. How do you age well through exercise? I recently completed the course, Lower Quadrant – Advanced Application, at Washington University in St. Louis. The instructor was Dr. Shirley Sahrmann, a respected Professor of Physical Therapy, author, researcher, and leading thinker in the area of movement impairment syndromes. Dr. Sahrmann is 76 years of age. She was very active throughout the course and displayed an incredible energy level. During one of our breaks, I had the opportunity to ask Dr. Sahrmann about her own exercise program and what is her secret to aging well. 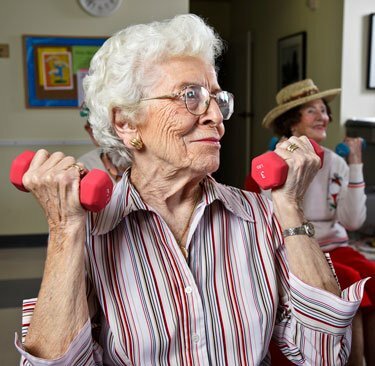 Her program consists of daily walking, riding a stationary bike, and the quadruped rocking exercise. She incorporates balance training into her activities of daily living. She also actively works on her posture in order to avoid what she calls “collapse-smasho”. Have a look at the video interview with Dr. Sahrmann. I think you will be impressed. In an earlier blog I spoke about my body building experience and some of the lessons I learned about how body-building can affect bone and muscle. While I was training for the body building competition, several life challenges came my way that took me off my strength-training program and affected my motivation to exercise. My mother passed away from Alzheimer’s in April and, later in the year, my sister died after a long battle with multiple sclerosis. Needless to say, I found it challenging to continue my body-building training. My priorities changed. I had to find my motivation to exercise. I still kept to an exercise program but it became a less intense program – exercise became more meditative and reflective. I kept walking, biking and doing many of the things that I enjoy doing. I also came to realize several important things. Our bodies are remarkably resilient. Sometimes the challenges we face can set us back weeks, months and maybe even years from staying fit and active. But if we persevere we can do amazing things. 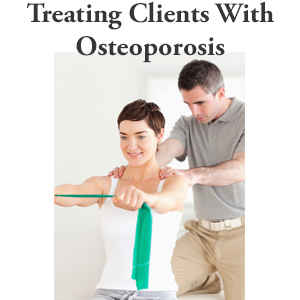 I have many clients who visit me at my Physiotherapy studio in Ottawa, and I have gotten to know many online through the MelioGuide Exercise for Better Bones program. I am impressed with how you deal with the challenges you face in your life – they are greater challenges than the ones that I face. I want to let you know that you inspire me and to thank you for how you keep me going. 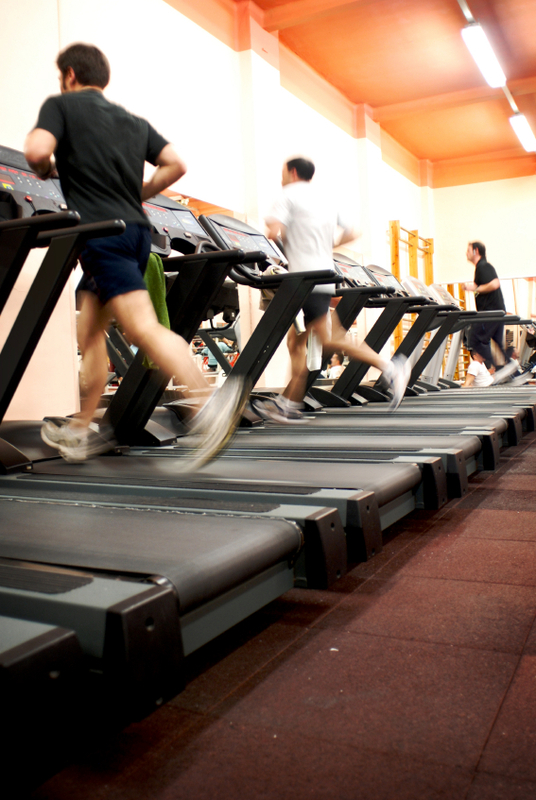 Where do you find the motivation to keep exercising? Please share your thoughts below in the Facebook comments box. Several weeks ago I posted a blog on my personal journey and, specifically, what motivates me to exercise. It turned out to be a topic that resonated with a lot of people—I received a great response from so many readers. I decided I should explore what motivates other people to exercise and keep going. Below is a comment from a reader who follows the Exercise for Better Bones program on what keeps her going. I enjoy reading your blog posts. There was one sometime ago about motivation. That got me thinking about how to re-motivate myself. I was still doing my daily Exercise for Better Bones program but I was getting into a rut with it. I wrote out the exercises I do on slips of heavy paper and every 3 days I mix up the slips and draw out the ones for each day without looking. So I never know which one is coming up. This little change has made a difference and has made things less “boring”. I have my “favorites”— the easy ones—and those that are more challenging. Thanks for the website and the blog posts! Love it!! 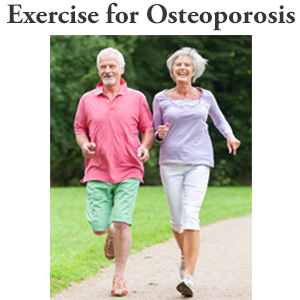 Changing the order of the exercises keeps it fun for you and “new” for your bones and muscles. Thanks for sharing. I decided that I should ask Babs, my 96-year-old client, what keeps her going. She trains three times a week with me. She is extremely committed, follows my direction, and never misses a session. When I asked her why she puts up with me she answered by saying “it makes me feel good”. She might “feel tired” at the end of each session but, as she says, “it helps me”. There are many reasons not to exercise. But you look at how my online reader mixed up her program to create variety and surprise herself. Or consider how Babs knows that her exercise sessions generate a good feeling that she can take through the day. Robert is an example of exercise benefits at any age. About a year ago we posted an article about Robert on prostate cancer and osteoporosis. In that post, Robert discussed the Exercise for Better Bones program and shared his commitment to exercise with us. Robert is 81 years of age and lives in California. He sent me an email recently with an update on his health. I asked him if I could share the main parts of the email with you because it is an inspiration to read about someone so committed to their health. Robert kindly agreed to share his story. 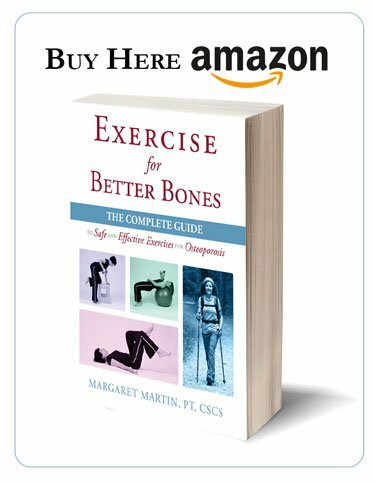 It’s been approximately a year since I signed up for the MelioGuide Exercise for Better Bones program. I am 81 years old and have low levels of testosterone. This leaves me feeling muddled and out of gas. My condition also affects my bones and other aspects of my health. Though the external administration of testosterone would do much to clear this up, it would at the same time feed the growth of the remaining prostate cancer. The oncologist currently in charge of my case has had me on estrogen as a substitute for almost a year, and this, along with my exercise, definitely seems to be helping. However, I still have do have a problem with fatigue and fogginess more often than I would like. The MelioGuide Exercise for Better Bones program and your interest and encouragement early on have been lifesavers during this period. Without my exercise routine (the MelioGuide Exercise for Better Bones program combined with a regular walking routine) there are many mornings when I’m not sure I would have had the willpower to get out of bed. I feel greatly indebted to you. I wish your clinic were located in California instead of Ontario. I will keep at it as I have been doing. It’s become a crucial part of my lifestyle. 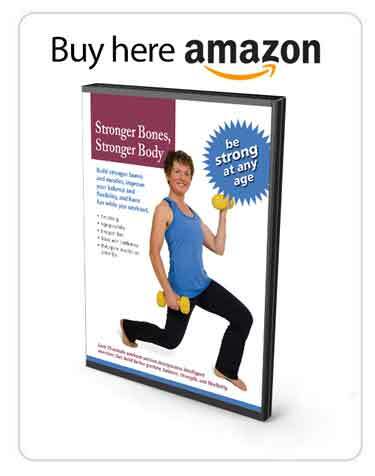 I feel very fortunate to have discovered the MelioGuide Exercise for Better Bones program. 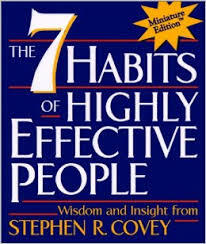 In 2012 we lost Stephen Covey, the author of Seven Habits of Highly Effective People. Stephen’s books and life work affected many people in a positive way. With 2012 coming to a close and 2013 around the corner, I want to pay respect to Mr. Covey with my own Seven Habits of a Healthy Life. The holiday season is a busy time for all of us. Think about the year that is about to start and how you can make it a healthier one. Here are seven habits that can lead to a healthier lifestyle. Your outlook matters. Keep things positive. In The Happiness Advantage, Shawn Achor suggests that each evening your reflect on your day and find at least three things that made your day special. Our ancestors carried heavy objects such as water, wood and cast iron pots. We have made our lives so convenient that we do not challenge our muscles and bones enough with regular day-to-day tasks. Lift something heavy once or ten times each day. Your bones and muscles will thank you. At the beginning of 2012, I shared a video by Dr Terry Wahl and how she used science to change her diet to fight her Multiple Sclerosis (MS). Dr. Wahl looked to food as her source of the nutrients her body needed to regain her health. Dr. Wahl found that fish oil, creatine and co-enzyme Q protected mice brains and mitochondria . She computed the human equivalents and started regular consumption of each of these items. She also identified the nutrients she needed to protect her brain and modified her diet to include these nutrients. Activities such as gardening, biking, skiing and hiking are all great but if you find that you can do them effortlessly, it is time to look for a new challenge. Are you able to find personal time to devote to activities that you enjoy and stimulate you? Participate in a routine that relieves stress and allows you to escape the day-to-day pressures of work. Consider activities that challenge your mind as well as your body. Tai Chi, yoga and dance are great physical and mental stimulants. The health benefits of sleep are well understood. The challenge for many people is how to get a good night’s sleep without relying on medication. If you are experiencing sleep problems, a good resource is Say Goodnight to Insomnia by Dr Gregg D. Jacobs at Harvard University. In his book, Dr, Jacobs presents a 6-week step-by-step programme to improve your sleep. When life gets busy and the stress level goes up, are you taking time to pause and breathe deeply? 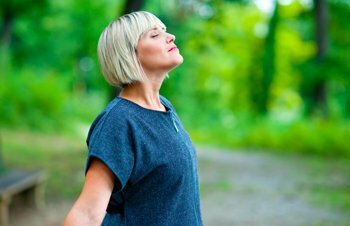 For many people taking a deep full diaphragmatic breath only comes during a yoga class. Make time before each meal to take slow breaths. It is a good time to reflect on how blessed we are. People who stay social, experience better health. At some point you will need that support network and staying in touch will lead to better experiences today and tomorrow. Ageing well means staying active. With many people now working from home and with offices undergoing many ergonomic changes, how do you avoid the health problems associated with sitting too much? Answer: try a standup walking desk. Before you spend all those dollars, you should read my TrekDesk Treadmill Desk Review where I discuss my setup that includes the TrekDesk and a LifeSpan walking treadmill. Ageing well means maintaining a consistent and positive outlook on life. Many of us are affected by seasonal affective disorder (SAD) and light therapy is a low cost, organic way to combat SAD. Learn more about seasonal depression light bulbs you can use during the low light seasons. What medication apps can help you maintain peace of mind? Read the Meditation Studio App and Buddhify Meditation App review to help you choose the best app for you. I recently wrote a review of a book I recommend on how to get a better night of sleep.